Yes, that’s right: Seventeen years after her debut, the aughts’ favorite red-headed teen action heroine is back. She’s back, she’s live, and in the ambitiously dada hands of directors Zach Lipovsky and Adam Stein and writers Josh Cagan, Mark McCorkle and Bob Schooley (the last two are also the animated series’ creators), she’s living the Spy Kids/Kim Possible mashup dream you never knew you always had. Telling the story live, and in 2019, meant a few details of Kim Possible’s whole sitch (beep beep be-beep) had to be slightly adjusted—fewer belly-baring shirts, more social anxiety, her holographic communicator embedded in a choker rather than a watch—but on balance, newcomer Sadie Stanley is the action-packed, crackerjack Kim Possible fans already know. This familiarity extends to her family, which includes Alyson Hannigan and Connie Ray as her neurosurgeon mom and ninja Nana, respectively; her kid-genius friend, Wade (Raven’s Home’s Issac Ryan Brown); her comically broad arch-nemeses Professor Dementor (Oswalt), Dr. Drakken (Todd Stashwyck) and Shego (Taylor Ortega) chewing up scenery like it’s bubble gum; and, of course, her sidekick/BFF Ron Stoppable, played here with such gooberific earnestness by The Goldbergs’s Sean Giambrone that you’ll wonder if you aren’t maybe watching a cartoon after all. It also extends to her public profile (notable), her casual friendships with celebrities (Christy Carlson Romano’s Poppy Blu) and even the surreal oddness of her school—it wasn’t until seeing the movie’s punny school signs (“Assembly Required” being one standout) that I remembered that detail as a signature of the original series, but the moment I did, I appreciated even more deeply how sharp the whole Kim Possible team was with the live-action adaptation. The only major way in which Kim Possible, the TV movie, diverges from Kim Possible, the TV series, is, in fact, the very thing which primes the engine for the movie’s main emotional arc: High school, for this Kim, is hell. Well, this is Disney Channel, so it’s not hell, exactly—but it definitely isn’t a jet-pack ride in the park. Whereas the series’ Kim was a whiz at everything she did, finding friction in her daily life only through her fractious interactions with queen bee Bonnie (played here by Erika Tham), the movie sees Kim attempt to sail into her first day as a high schooler on the winds of her own past excellence, only to crash and burn. She can’t get to a single class on time. No one finds her heroics at all interesting. Cheerleading is out, soccer is in, and Bonnie’s the team’s gatekeeper. By the end of the first day, when a shellshocked Kim stumbles on a weeping Athena (Ciara Riley Wilson)—the only freshman who seems to have had in worse than her, and the only one in the whole school who turns out to be a Kim Possible superfan—well, naturally Kim is ready to barrel into playing the hero by becoming Athena’s friend. 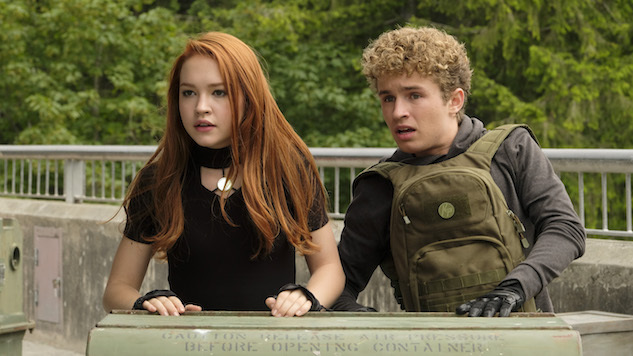 Still, while I won’t (honestly, couldn’t) spoil the surreal adventure that is Kim Possible, I can tell you that everything you will love about the movie, stars Sadie Stanley and Sean Giambrone love, too. Catching up with the two by phone in the middle of their whirlwind press tour, Paste got some of the inside scoop about what it was like to jump into such a beloved franchise from a whole different generation. Dementedly funny, one might say. But you won’t know for sure how much until you catch this newest incarnation of Kim Possible for yourself. Kim Possible premieres tonight at 8 p.m. on Disney Channel.